The team members here at Applied Technologies, Inc. (ATI) are dedicated professionals who are passionate about what they do. It is always exciting when that passion is recognized through their activity and involvement in professional associations. Katie Hassing is an environmental engineer with 12 years of municipal water and wastewater management experience at ATI. Her technical expertise and management style have resulted in lead design roles for several ATI projects. Throughout the industry, Katie is receiving recognition for her project work and association involvement, such as the Collection Systems Committee for the Central States Water Environment Association (CSWEA). 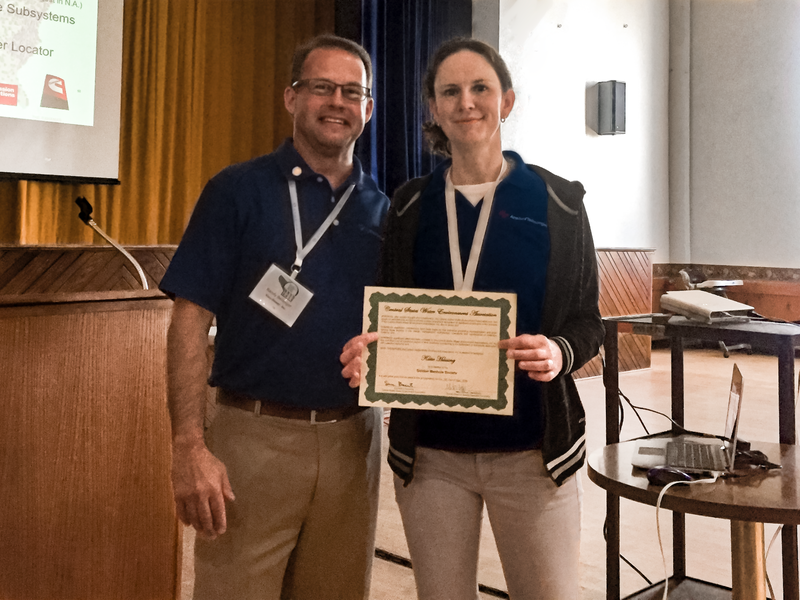 On June 7, 2018, Katie was awarded the CSWEA Golden Manhole Society Award for her contributions to the Collection Systems Committee throughout the last seven years. The award is presented to members from each State section – Illinois, Minnesota, and Wisconsin – who have been nominated for their significant contributions to the field of wastewater collection systems. Members are recognized for their involvement in the management, design, or operator education associated with sanitary sewer systems. Katie manages several key tasks for the annual Collection Systems Seminar. She designs and proofs the brochure, oversees the continuing education process, and secures the audio-video services for the Watertown seminar. Additionally, she hosts the Committee’s initial planning meeting. Katie’s active involvement in committee activities reflects the passion she has for the field of water and wastewater management.